One of the beautiful things about Q-SYS is it’s ability to control other devices in the system without additional hardware. 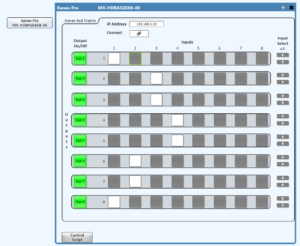 A prime example is our Q-SYS plugin for KanexPro video matrices. We have versions for 4×4, 6×6 and 8×8 HDMI and HDBT matrices but the plugin is written in such a way that just by changing the number of buttons in the interface, you can adjust the one copy of the plugin to work with any of models in the KanexPro lineup with minimal modification. The plugin also has full feedback from the devices so changes made from the front panel are reflected in Q-SYS. 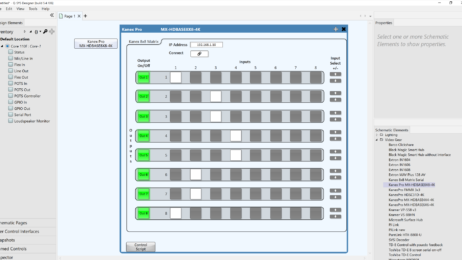 You can download this plugin from our Q-SYS control forum on our Techrep Wiki. Email me at chris.bednar@techrep.com for access.